Katie Derham's guests are mezzo Wallis Giunta, violinist Sandro Roy and the Jermaine Landsberger Trio, and composer Alexander Campkin. Katie Derham presents a lively mix of music, conversation and arts news. Her guests include composer Alexander Campkin, whose music will be performed by the Bournemouth Symphony Orchestra's groundbreaking disabled-led ensemble BSO Resound at the BBC Proms on Monday. Also at the Proms on Monday will be mezzo-soprano Wallis Giunta, who'll be performing a programme of Bernstein and beyond at Cadogan Hall - she gives us a taster live in the studio. 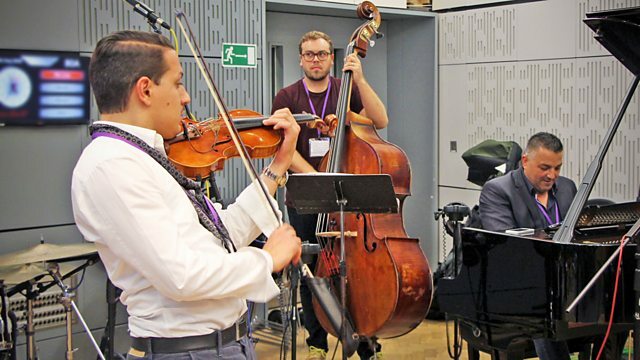 Plus violinist Sandro Roy performs live with the Jermaine Landsberger Trio before playing at the legendary Ronnie Scott's in Soho tomorrow. Performer: Sandro Roy. Performer: Jermaine Landsberger. Performer: Tim Thornton. Performer: Sebastiaan de Krom. Performer: London Sinfonietta. Conductor: Gregory Rose. Ensemble: BSO Resound. Conductor: James Rose. Choir: Royal Academy of Music Chamber Choir. Conductor: Patrick Russell. Performer: László Rózsa. Performer: Jonathan Rees. Performer: Alex McCartney. Performer: Paul Goodwin. Performer: Lorraine Wood. Performer: Sophia McKenna. Performer: Alberto Grazzi. Ensemble: The English Concert. Conductor: Trevor Pinnock. Fasch: Concertos/Orchestral suite: The English Concert/Pinnock. Performer: Wallis Giunta. Performer: Michael Sikich. Performer: Kristine Balanas. Performer: Huw Watkins.